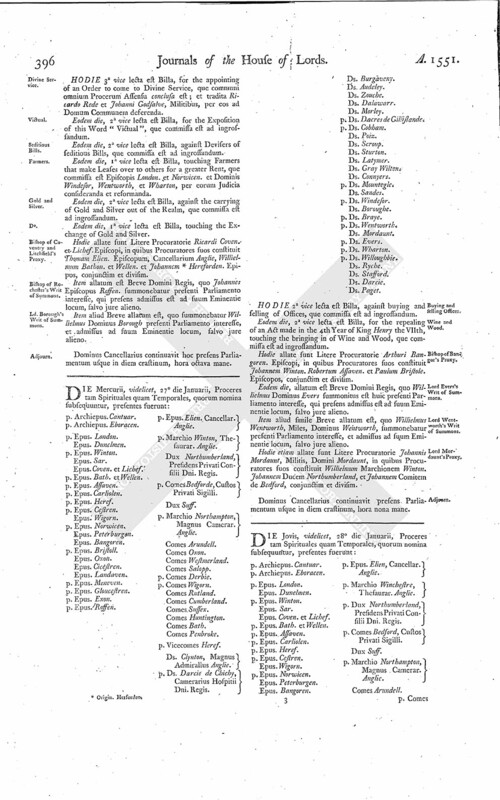 Lord Evers's Writ of Summons. Lord Wentworth's Writ of Summons. p. Ds. Darcie de Chichy, Camerarius Hospitii Dni. Regis. HODIE 2a vice lecta est Billa, against buying and selling of Offices, que commissa est ad ingrossandum. Eodem die, 2a vice lecta est Billa, for the repealing of an Act made in the 4th Year of King Henry the VIIth, touching the bringing in of Wine and Wood, que commissa est ad ingrossandum. Hodie allate sunt Litere Procuratorie Arthuri Bangoren. Episcopi, in quibus Procuratores suos constituit Johannem Winton. Robertum Assaven. et Paulum Bristole. Episcopos, conjunctim et divisim. Eodem die, allatum est Breve Domini Regis, quo Willielmus Dominus Evers summonitus est huic presenti Parliamento interesse, qui presens admissus est ad suum Eminentie locum, salvo jure alieno. Item aliud simile Breve allatum est, quo Willielmus Wentworth, Miles, Dominus Wentworth, summonebatur presenti Parliamento interesse, et admissus ad suum Eminentie locum, salvo jure alieno. Hodie etiam allate sunt Litere Procuratorie Johannis Mordaunt, Militis, Domini Mordaunt, in quibus Procuratores suos constituit Willielmum Marchionem Winton. Johannem Ducem Northumberland, et Johannem Comitem de Bedford, conjunctim et divisim.